Josh Wilson says he had no doubt Chorley would make it to the play-offs as the Magpies prepare to face Stockport at Victory Park tonight. The sides face off in a play-off eliminator this evening in a bid to reach the semi-final, with Matt Jansen’s men bang in form. A jam-packed April saw Chorley pick up six league wins, one draw and just the one defeat to climb from ninth back into a play-off berth. And now as they sit just three wins away from the National League, Wilson says this squad has the quality to get to end a near three-decade absence from the next tier. Wilson, 29, joined the club from fellow National League North outfit Telford in the summer with one eye on promotion. “That is the main reason I signed for Chorley,” he said. “The years I have played against them they have always been fighting at the right end of the table and always been in contention and the play-offs. The Magpies fell at the final hurdle last term, losing in extra time of the final to Halifax. Wilson is now fit for tonight’s match after returning from a knock to feature in the last league game of the campaign, a 1-0 win over Alfreton. He said: “Hopefully there is a lot more football still to play. Meanwhile, Jansen says Chorley skipper Andy Teague has proved his doubters wrong. The 32-year-old is a key figure in a defence that has conceded just 39 times this term. That was recognised when the defender picked up the club’s player of the season award. Jansen said: “Last season people were questioning whether Andy’s legs had gone. He had an injury and he struggled to get back to full fitness. “But he has worked so hard and he has been colossal this season, both on and off the pitch. “He had his doubters but has proved how valuable and what an asset he is to this team. 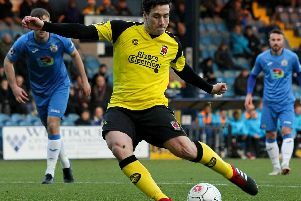 Chorley players’ player of the season Adam Blakeman will miss the Stockport game this evening, along with Matty Hughes, as they both serve suspensions.